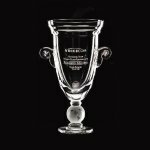 In the design of the traditional Loving Cup, this exquisite faceted crystal cup features sleek gold handles and stem and is mounted on a solid black marble base. Personalize the base for the ultimate in recognition. This stunning crystal piece comes packaged in an elegant lined presentation box. 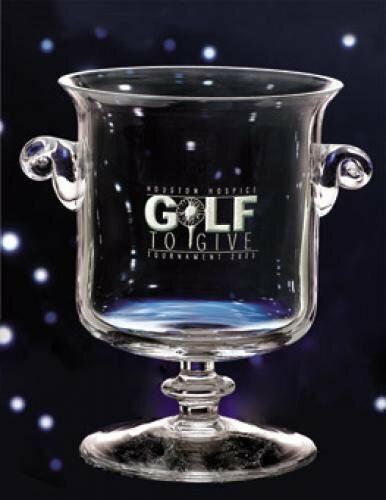 In the design of the traditional Loving Cup, this stunning lidded crystal cup has ornately detailed silver handles and is mounted on a solid black marble base. The base can be personalized, creating a classically beautiful recognition of excellence in achievement. This Premier crystal comes packaged in an elegant lined presentation box. 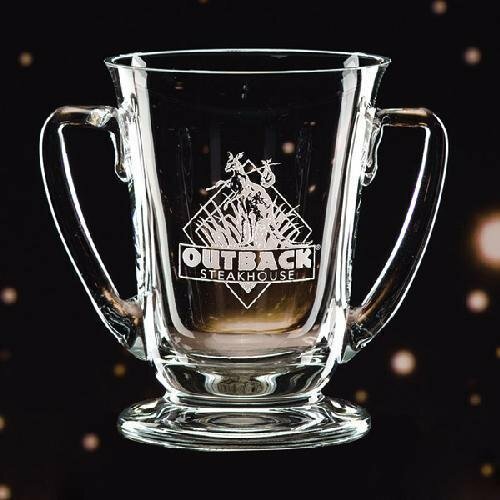 Your event will withstand the test of time when you present our Cup Adirondack. 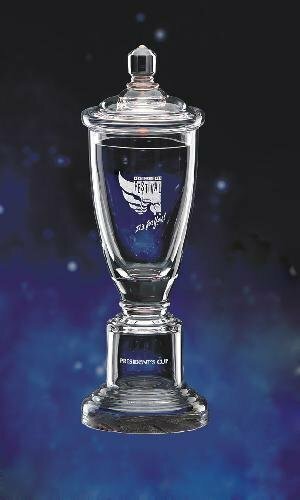 This hand-blown classic features a unique pedestal for engraving your award inscription that is sure to look stunning in our designer format. Please note that the nature of mouth-blown hollowware often produces bubbles and other imperfections and are not considered defects. 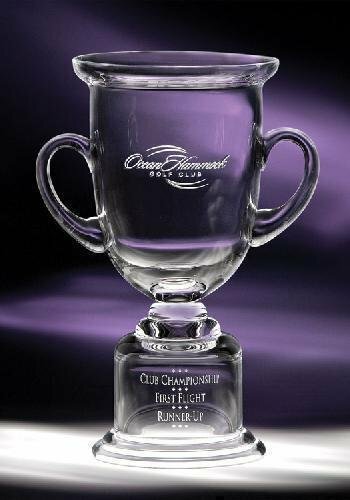 These Corporate Crystal Aspire Bowls come with a matching crystal base and stem and are ideal to recognize the ultimate in achievement. 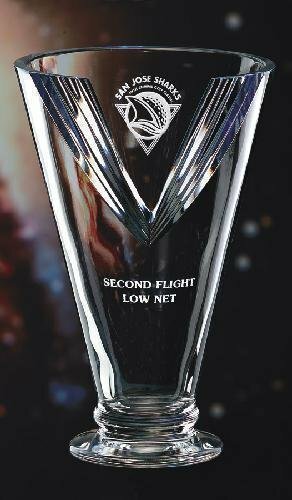 Boasting beautiful crystal cuts to bring sparkle and uniqueness, adds another dimension to these awards. 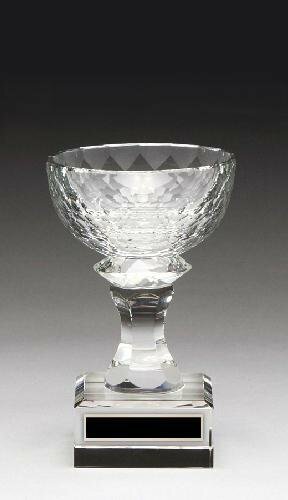 With a choice of 3 height sizes, 6", 7", or 8", and with plenty of area for your personalization needs, these crystal aspire bowl awards will be a hit. 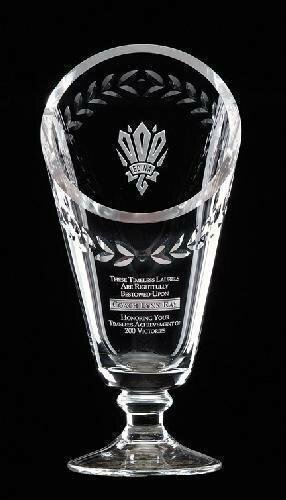 All crystal awards can be lasered or sandblasted for personalization. A handsome blue presentation box is also included with these items. Imagine the expression of the person when they see their name on one of these impressive awards. This classically influenced shape is mouth blown for extra sparkle and lots of weight. 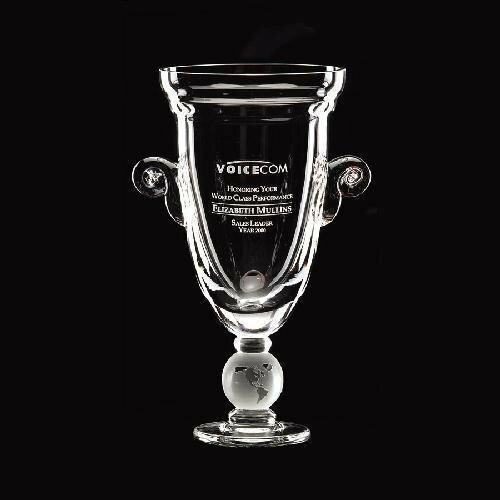 For best appearance we recommend etching your award inscription on the base as shown. Outstanding value. Please note that the nature of mouth-blown hollowware often produces bubbles and other imperfections and are not considered defects. The laurel wreath, a symbol of triumph since the ancient Greeks, receives a new interpretation. The cut glass wreath that encircles the ellipse is contemporary yet timeless. This expression of greatness is mouth-blown and hand-cut by highly skilled European artisans and is a prized possession for sure. A romance card elaborating this theme is included for your presentation. Please note that the nature of mouth-blown hollowware often produces bubbles and other imperfections and are not considered defects. Cup McKinley features a little bit of class and a whole lot of sparkle at a very affordable price. Available in three sizes, this mouth-blown import will not disappoint. Please note that the nature of mouth-blown hollowware often produces bubbles and other imperfections and are not considered defects. Quality craftsmanship, excellent weight, and sparkling clarity are the hallmarks of these mouth blown pieces of European crystal. Choose from three traditional shapes used for centuries to symbolize success. Please note that the nature of mouth-blown hollowware often produces bubbles and other imperfections and are not considered defects. 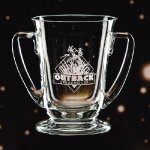 Introducing a trophy cup that is truly a cut above! Our Victory Cup flashes the universal ?V? for victory in a way that cannot be ignored. Mouth-blown and cut by hand, this radiant prize is crafted of very heavy full-lead crystal. For aesthetics we recommend your award inscription and logo positioned as shown. Due to the handcrafted nature of this piece, please expect small bubbles, etc. will occur. Please note that the nature of mouth-blown hollowware often produces bubbles and other imperfections and are not considered defects.